My suggestion that low power assist is all you want received support and scepticism in a discussion at Endless Sphere. 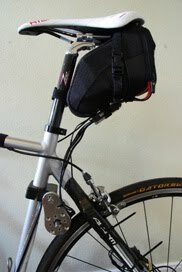 Having formed the view you don't need much help to cycle fast I'm wondering how it can best be done and wish to select a motor and model some scenarios. The Gruber Assist, shown in Figure 1, provides a high cost, low power solution that is visually stealthy enough for Fabian Cancellara to be accused of using it during Paris Roubaix and the Tour of Flanders but too noisy for it to be true. Detailed performance information is unavailable but reviews are generally enthusiastic. Negatives reported are 50% efficiency and simple on/off control. Figure 1: The Gruber Assist is a stealthy 100W output motor that resides in the seat tube. Bosch mid drive motors have integrated control and display, use pedal torque sensors and offer several operation modes. They appear close to ideal but I'd prefer a mobile phone as the display device, at 4 kg they are heavier than some alternatives, they need a frame designed to fit, and the control algorithms are not published and can't be altered or integrated into cycling tracking applications. Some other mid drive e-bikes are available, like the low cost Aseako/Zoco Rossa. Friction drive, shown in Figure 2, provides an alternative using small, high speed RC motors but the transmission losses driving the tyre are probably high. Figure 2: A lightweight friction drive. Other alternatives are hub drives which are either direct drive or the lighter less powerful geared motors. Albert van Dalen has done an investigation of bike motors that focuses on efficiency and compares them on weight vs rated power. 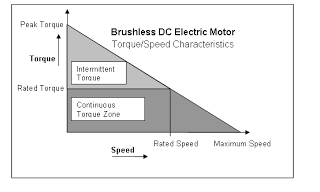 Modern bicycle motors are brushless DC with six step trapezoidal control explained in this video. Controllers are cheap, from about US$18, but produce motor torque ripple that is often audible. For little additional expense, controllers could use better algorithms to eliminate noise. Figure 3 shows an example of noise reduction in a direct drive hub motor using sinusoidal control. Figure 3: An example of noise reduction achieved in a direct drive hub motor with sinusoidal control. There seems to be a gap in the market as only trapezoidal controllers are commercially available. Torque ripple is avoided by rotating the magnetic flux vector so that it is always perpendicular the magnetic flux vector of the spinning magnets which can be achieved with field oriented control. In contrast to applications like washing machines, torque loads on e-bike motors vary slowly and typical e-bike motors produce sinusoidal back EMFs1. Under these circumstances the simpler sinusoidal control generates the same output as field oriented control. Field oriented control is often suggested as a means of increasing motor efficiency. In a simulation Johan Astrom2 found only a marginal efficiency improvement with an optimal control scheme over trapezoidal control for a 375 W motor because a non perpendicular magnetic vector mostly acts to store and release energy in different parts of the cycle. Geared motors can also produce gear noise. The lightweight Tongxin/Keyde hub motor uses rollers rather than gears which is reported as effective for motor silencing but may increase gearbox friction losses. Previously, unregistered electric bikes in Australia were required to "be able to prove that the motor output is not more than 200 watts" but there were no restrictions on how that power could be used. Recently the European standard EN 15194:2009 was introduced as an alternative which allows motors rated up to 250 watts continuous while requiring riders to pedal at speeds above 6 km/h (clause 4.2.4.3.1) to receive assistance and restricting assistance to speeds below 25 km/h. With the usual controllers, a 200 W maximum means much lower power over most of the operating range, so most Australian electric bikes probably exceeded the previous requirement. For those bikes that didn't, the change from "not more than" to "continuous" means motors are potentially a lot more powerful than a 50 W increase would imply. The continuous motor rating power is only loosely related to instantaneous power as shown in figure 4. Figure 4: The rated power is at the intersection of the rated speed and rated torque lines. The position of the sloping line is determined by the rated voltage. The rated values are nominated rather than physical properties of the motor. The continuous motor rating is a value assigned by the manufacturer at which the motor is guaranteed not to exceed temperature specifications as defined in IEC 60034-1 clause 8.10 - Limits of temperature and of temperature rise. 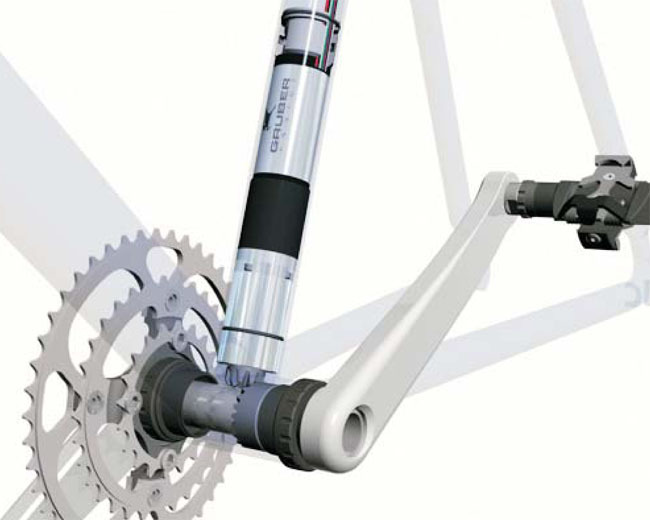 As an example, Bosch mid drive motors, rated at 250 W, have input power measured in figure 5, above 600 W for considerable periods while climbing a 5.5% grade pedalling at speeds around 23 km/h prompting reviewers to conclude the "Bosch mid drive feels as zippy and fast as 750-watt hub motor bikes." Figure 5: Bosch mid drive input power while climbing a 5.5% grade pedalling at speeds around 23 km/h. Output power is probably about 75% of input power. Fast cyclists exceed speeds of 25 km/h, so incapable riders seeking to keep up will need assist at speeds above 25 km/h. EN 15194:2009 clause 4.2.6.2.2 c) specifies that the maximum speed test should be conducted at 1.25 times the rated speed, therefore some assist can actually be provided up to 31 km/h and still comply. This is above the speeds the average rider can maintain on flat ground but far short of the 41.6 km/h Chris Horner maintained over 172 km in the sample ride. Bosch overcome this limitation by also selling a "Drive Unit 45" version which lifts the rated cut off speed to 45 km/h. The Cute Q-85SX/GBK-85F, detailed in this drawing was suggested by Albert van Dalen. It is nominally 1.6 kg but was tested as 1.84 kg including electrical cable. He doesn't consider a lighter, nominally 1.2 kg motor in the Cute drawing, which may not be purchasable, and he chose the Cute over the Tongxin/Keyde which is nominally 200 gm lighter at 1.4 kg as the Cute was more easily acquired3. Accepting his motor recommendation, Albert's motor testing data can be used to model e-bike scenarios. Albert conducted a carefully documented motor investigation and dynamometer test from which he constructed a motor model. 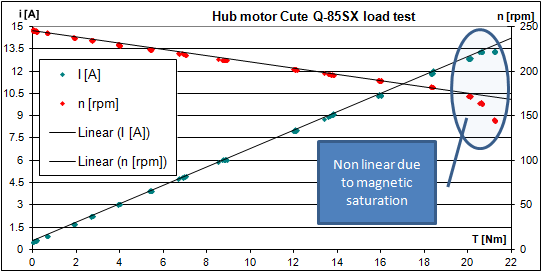 The dynamometer data, in figure 6, shows evidence of saturation beyond torques of 20 Nm, corresponding to a motor current of 12.9 amps, so a model is only valid for torques <20 Nm. Saturation could be avoided with more iron, but space is limited so that would necessitate less copper, increasing electrical resistance and reducing motor efficiency at torques <20 Nm. To avoid rapidly increasing inefficiency and overheating, this motor should be operated at currents less than 12.9 amps, though higher currents are sometimes used. This matches the Ku63 controller which limits current to 12 to 12.85 amps. Albert measured motor winding resistance as R ≈ 0.307 Ω (stated as mΩ but intended as Ω) but elsewhere he calculated R = 0.77 Ω which is a substantial difference. He accounts for the difference as gearbox friction and uses the measured value in his model, however the relationship:- Vo = (I * R) + (ω * Ke) which is expressed in Albert's notation as U = (I * R) + (ω * k) is independent of gearbox friction losses. Rearranging to k = (U - I * R)/ω, the motor constant (k) can then be plotted against rotational speed (ω) of the wheel using the dynamometer test data as shown in Figure 7. Figure 7: Motor constant k versus ω with R = 0.307 Ω. Slope should be zero. Adjusting to R = 0.75 so that the slope of a linear estimate of k = 0 gives the result in Figure 8. Figure 8: Motor constant k versus ω with R = 0.754 Ω. Mean value of k = 1.55. Note: The y axis scale is different to figure 7. The inconsistency of the estimated resistance with the measured resistance is a mystery which would be good to resolve. The estimated resistance is used for the motor model. Torque is measured after the gearbox and is reduced by friction losses as shown in figure 9. 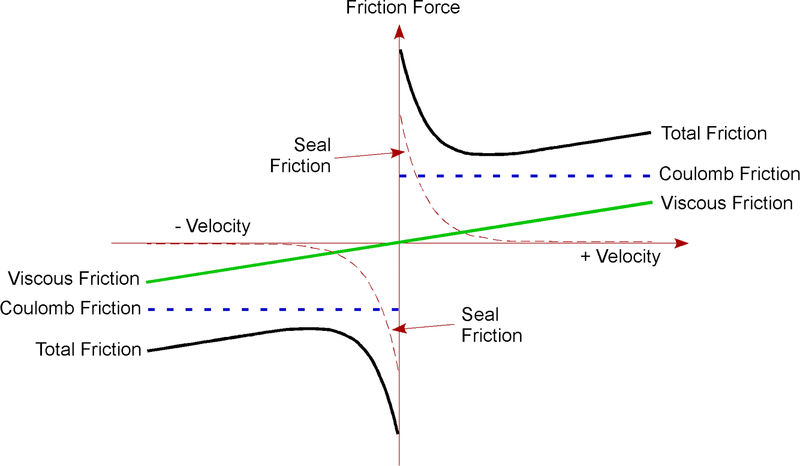 Figure 9: Different types of friction losses sum to the total friction loss. 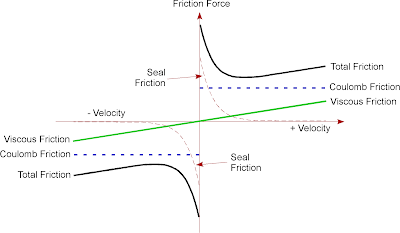 Friction at velocities near zero are ignored as very low speed behaviour is not modelled. Figure 10: Motor constant k versus motor speed ω with R = 0.754 Ω. Mean value of k = 1.55. Values for Cv and Cc can be found numerically to best match k to the previously determined value while minimising the slope of a linear estimate of k as shown in figure 10. Cc = 0 which means Cc can be ignored in the motor model. The patterns evident in figure 10 suggest the model is not fully representative of the motors behaviour but the resultant errors are acceptable and being determined from large numbers of independent measurements should be considerably less than the estimated 5% error for individual measurements. The parameters R = 0.754, k = 1.55 and Cv = 0.033 can be used to construct the motor model which can then be combined with the previous bike model and used for simulations of electric bike scenarios in a future post. Renesas Application Note: 180 Degree Sinusoidal Motor Control Based on this document; pg 3; " As many brushless motors have sinusoidal BEMF ..., it is possible to match these motors with a sinusoidal driving voltage." Johan Astrom; Investigation of Issues Related to Electrical Efﬁciency Improvements of Pump and Fan Drives in Buildings; PhD Thesis; Department of Energy and Environment, Chalmers University Of Technology, G¨oteborg, Sweden 2011; Figure 6.23 pg 97; The graph shows marginal improvement, about 3% maximum in part of the efficiency/load curve with an optimal control scheme over standard BLDC motor control for a 375W motor. very interesting, i like this article. Ken, this comment is completely off topic. It is a note regarding your query about Powercal which you recently raised on my post of 18 July 2010 about HRV during exercise. As I stated in my first response, I do not know how Powercal works. My initial speculation was based on the possibility that it might use a multivariate pattern recognition algorithm. The more I thought about it, the less sense that made, so I found some Powercal data on the internet and did a bit of reverse engineering. It looks as if the algorithm is very simple. If I my current speculation is correct, it does not use HRV data in the usual sense (ie the scatter of HR values around the mean in a period of interest). It merely adjusts a crude linear estimate of the relationship between HR and power according the current rate of change of HR. I tried it on some of my own HR v power data acquired when exercising on the elliptical cross-trainer. It appears to work fairy well, though as CycleOps admit, it would be inadequate for a serious cyclist who wants to monitor changes in fitness in response to training. Thanks for the response. I have in turn responded at http://canute1.wordpress.com/2010/07/18/hrv-during-exercise/#comment-3767 .